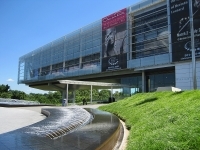 History buffs visiting Little Rock should be sure to visit the William J. Clinton Presidential Center and Park, the presidential library of former US president Bill Clinton that features the Clinton Presidential Library, the offices of the Clinton Foundation, and the University of Arkansas Clinton School of Public Service. Visitors can enjoy viewing artefacts from Clinton's two terms as president at the museum, including full-scale replicas of the Clinton-era Oval Office and Cabinet Room. Other exhibits include Clinton's Cadillac One, a gallery consisting of a 110-foot (34m) timeline of each of Clinton's years as President and 14 alcove displays featuring the Oklahoma City bombing, and Northern Ireland and Middle East peace efforts, as well as personal letters written to and by the Clinton family and family photographs. The Clinton Presidential Center is a slick attraction and a popular stop in Little Rock.